Adult Girl Scout Uniform made between 1978-1984. In 1978, Girl Scouts unveiled a new uniform designed by American high fashion designer Halston. The collection included coordinated sage green polyester gabardine fabric pieces. The Jacket and A-line skirt are shown here. Other options included a long sleeveless vest, and straight legged pants. All pieces would have been worn with an ivory colored silky polyester blouse. Women had the choice of 2 hats – a beret or a visor. A matching sweater was introduced in 1980. 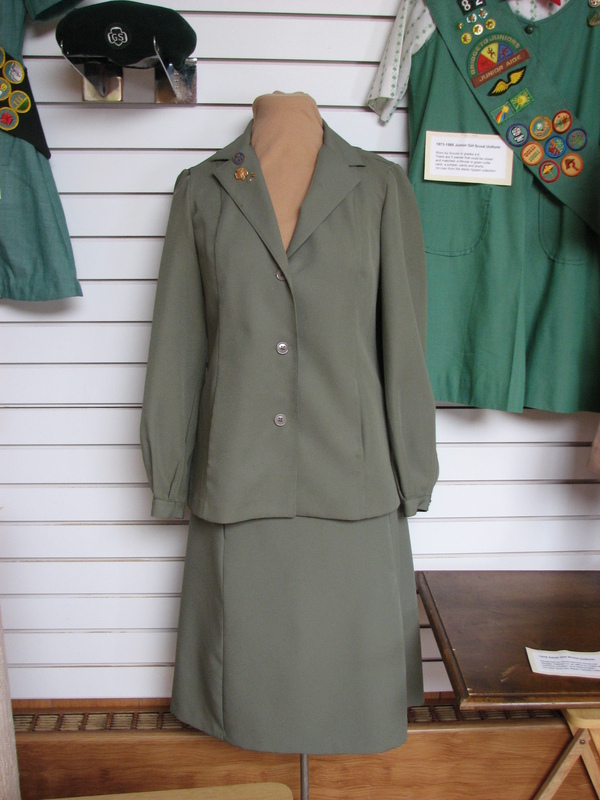 This uniform was an attempt to bring high fashion to Girl Scout leaders and was a very contemporary design. This uniform is on loan from the Marie Ogdahl collection. In honor of the 100th anniversary of Girl Scouting, a collection of “Girl Scout Uniforms Through the Years” is on exhibit at the Museum now through March. This entry was posted in Collection Notes, Museum updates and tagged 100th anniversary, 1970s, 1980s, Adult Uniform, Girl Scout, Girl Scout Uniforms, Glenwood Girl Scouts, Pope County Museum, Vintage Girl Scout Uniform. Bookmark the permalink.